The first proposers of the Ayrshire Cup were two medical students, a John Smith of Mauchline and a Mr Wilson of Ayr. After failing to persuade Ayr Thistle to take up the task, John Wallace of Kilmarnock took up the baton. Voluntary contributions, almost exclusively in Kilmarnock, helped finance the competition and was instrumental in the town having an almost exclusive hold on the choice of final venues. Indeed it wasni’t until 1897 when the final tie was played outside the town with Ayr being the choice. The following notes regarding the competition in the 20th Century have been supplied thanks to David Ross. There were a couple of occasions when the winners didn't actually 'win' the Final. In 1921 Ayr United refused to replay at Rugby Park on the date set by the Ayrshire FA so Kilmarnock were awarded the trophy. In 1959 the scores were level after two legs so in the days before penalty shoot-outs or away goals counting double the rule was that in the event of a tie the holders kept the trophy so it stayed in Ayr. Penalty shoot-outs were introduced in 1970-71. 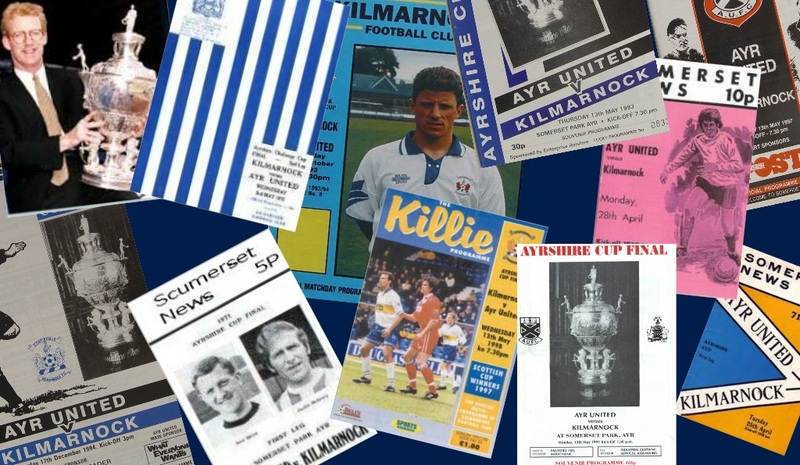 Between 1946-1978 Kilmarnock and Ayr United were the only entrants. Prior to WW2 the number of entrants fluctuated - from a peak of over forty to just four in the 1930s (Kilmarnock, Ayr United, Beith and Galston). In 1978-79 Girvan joined the competition. The last winners outside the 'big two' were Beith in 1926-27. Although the competition was suspended during WW2 the second leg of the 1938-39 final was played on September 30th 1939, after the outbreak of war but eight days after the SFA lifted their ban on competitive football. The latest date for a final is for the 1932-33 competition which was actually played in February 1934. However the 1934-35 competition took longer to conclude. 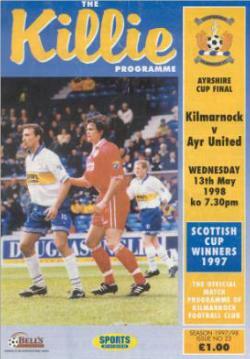 The final was held at Rugby Park in October 1935 but was drawn 3-3. 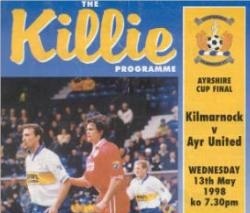 The replay at Somerset wasn't played until 22 April 22 1936 when Kilmarnock won 8-0 (a record score for a Kilmarnock-Ayr United game) with six different players scoring. Most successive wins is seven - Kilmarnock from 1950-51 to 1956-57 inclusive. Kilmarnock have also won five times in a row 1980-81 to 1984-85 inclusive. 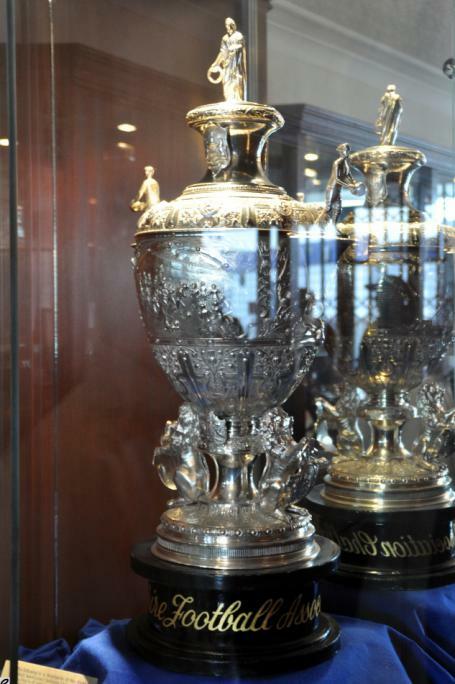 They were the first club to win three in succession (1884, 1885, 1886), a feat they achieved on several more occasions. Ayr United's best run was four in a row from 1974-75 - 77-78. They also won three in succession - 1968-69, 1969-70, 1970-71. No other club has won more than twice in succession though Stevenston United - winners in 1914-15 and again in 1919-20 held the trophy for six seasons as it wasn't contested between those dates. Some snippets on managers. Most successful was Kilmarnock's Malky MacDonald with eight victories. Best for Ayr was Ally McLeod with seven, the same tally as Kilmarnock's Hugh Spence. MacDonald & McLeod were also both in charge of Scotland of course. The only ACF in which they were opposite each other was 1966. 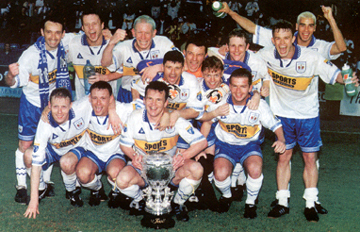 Other Scotland managers to have won the Ayrshire Cup are Tommy Burns and George Burley. They faced each other in the ACF in 1992 & 1993. Ayr manager Gerry Mays (1962) was a former Kilmarnock player. And Alex Gibson who managed Ayr in the 1932-33 competition (completed in 1934) was a former Kilmarnock Chairman! James MacDonald, Ayr secretary/manager in the early 1920s held the same position at Rugby Park before WWI and Ayr boss from 1979-1983, Willie McLean, was the brother of Kilmarnock players Tommy & Jim.